The WMIEPU26 Series of Class II AC/DC wall mount power supplies offers up to 25 watts of output power in a 2.95” x 1.71” x 1.58” package. This series consists of single output models ranging from 5 to 48VDC with a wide input voltage range of 90~264VAC. This series meets FCC Part-15 Class B and CISPR-22 Class B Emission Limits and has UL60950-1:2nd Edition, IEC 60950-1:2005/A2:2013, and EN60950-1:2006/A2:2013 safety approvals. All units are RoHS2 and Energy Star Level VI compliant. 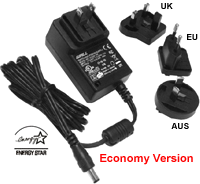 Plugs come in United States (US), Europe (EU), Australia (AUS), and United Kingdom (UK) types. Plugs are sold separately so please contact factory for ordering details. Notes: (1)	The “x” in the model number can be “U” for US type plug; “E” for EU type plug, “A” for AUS type plug, or “K” for UK type plug. (2)	The output voltage is specified as a range (Ex: 40~48VDC); the customer must specify what they want the voltage set at. (4)	At factory, each output is checked to be within voltage accuracy in 60% rated load condition. (5)	Line regulation is defined by changing ±10% of input voltage from nominal line at rated load. (6)	Load regulation is defined by changing ±40% of measured output load from 60% rated load. (7)	Ripple & noise is measured by 20MHz BW limited oscilloscope & terminated each output with a 0.47uF capacitor @rated load and nominal line. (8)	Hold up time is measured from end of last charging pulse to when main output drops down to low limit of main output @rated load and nom line. (9)	Models WMIEPU26-102~109 need to use AWG#18x2C/4FT output cable in order to meet the total regulation specified. 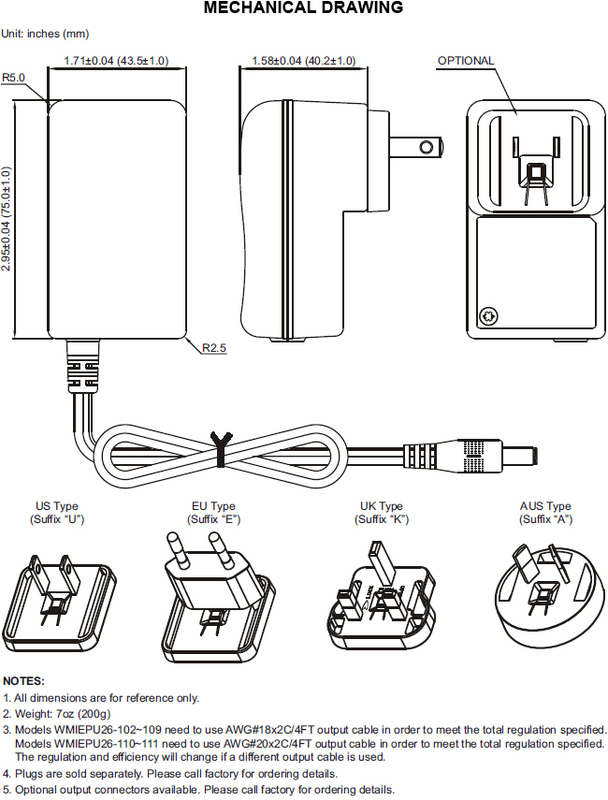 Models WMIEPU26-110~111 need to use AWG#20x2C/4FT output cable in order to meet the total regulation specified. (10)	Plugs are sold separately, please contact factory for ordering details. (11)	Optional output connectors are available. Please contact factory for more information.